Ghati Subramanya is one of the popular pilgrim centers located near Doddaballapur of Bangalore Rural district. 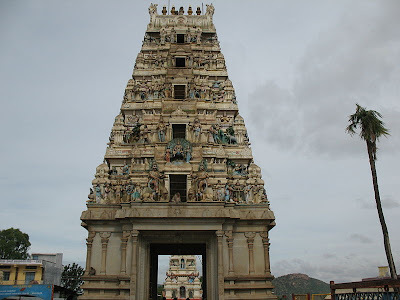 Ghati Subrahmanya is located about 60 Kms from Bangalore. The temple here is dedicated to Lord Subramanya and Lord Lakshmi Narasimha. It is believed that the idol of Shri subrahmanya is self originated. The uniqueness of the temple is, Sri Subrahmanya is facing east and Sri Lakshmi Narasimha is facing west in a single image. One can have darshan of Lord Narasimha through a mirror placed rear side. This unique and ancient temple attracts many a pilgrims. Special pooja's will be performed the event of Brahmarathotsava, i.e., on the day of Pushya shudda Shashti. Narasimha Jayanti is other major festival celebrated here. Marriage functions are also held here. It is lord Murugan's temple and very much in tradition with the "Kukke" subramanya temple. Here you find him in the "Naga" avathar and all the "sarpa (snake) dosha" related poojas are performed here. Free lunch is provided daily for the devotees. Take the road from Hebbal towards Bangalore International Airport in DevanaHalli. Before touching Yelahanka, one needs to take the deviation to right to continue to devanhalli . After Devanahalli bus stand, there is a left turn that moves towards Doddaballpur. Proceed along here until you reach the road coming from Bangalore (Hindupur Road). Take a right here and proceed towards Ghati SUbramanya. Ask locals for directions (they are generally helpful). Buses are also available from Bangalore City Bus Station to Ghati Subramanya and Doddaballapur, but it is advisable to take your own transport for flexibility in your trip. What do u mean by Kuja-Rahu Sandhi ? Could you please elaborate on that more..
What is 'Sandhi'. Do you mean Shanti? Are you referring to Kuja Dosha Shanti ....or do you mean something else. if Rahu and Mars are together in horoscope, then it is called Kuja-Rahu Sandhi. Temple Darshan timings. Planning to visit temple in the coming week.